We all know or have seen the effects of a good social media reach. Some of our favourite Facebook pages get thousands of likes, followers and tons of engagement daily. But, why is it that even though you seem to be doing the right things, you’re still not increasing your social media reach like these other pages? This is a million-dollar question that everyone who has created a social media page wants to know. How can a business or an individual grow their social media reach without paying for it? Sometimes businesses prefer to grow their social media reach organically. They will not pay for advertisements and would rather gather likes slowly and organically. This option is beneficial for small businesses who find that paying for social media marketing is too expensive. Simply creating a social media account and posting content is not enough, you’ve got to make sure that your page is optimised for search engines. When Google crawls your social media pages, they are looking for relevant information such as name, description, the number of likes, and the number of people talking about your page. This information will help them to list and rank your page with the right keywords. Failing to add the right information will land your business at the bottom of search engine results. Funny enough, this is a mistake that the biggest brands are doing. 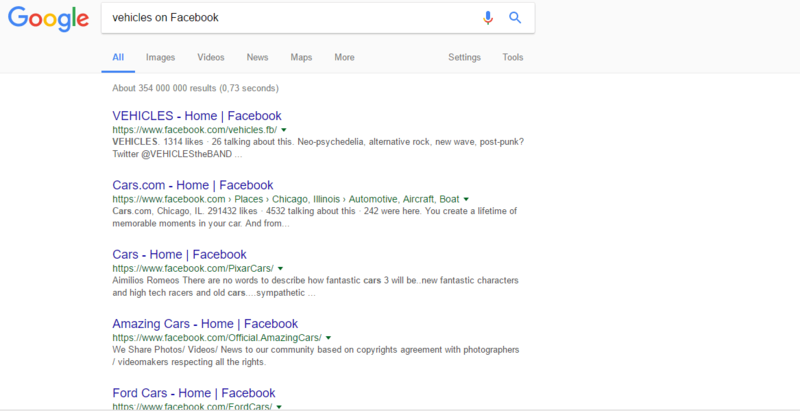 A simple search for “Vehicles on Facebook” for example, brings up small business results and none of the big car brands. This is because these small businesses have learned how to optimise their Facebook pages. Add an important keyword in your profile name. for example, if you’re in the car business, add “cars” in your profile name. Request reviews from customers. Request at least five reviews from your best customers. This will make your page stand out from the crowd in search results. Add hashtags to your post. Many people search certain keywords in the Facebook search bar. If you search “cars” for example, all the posts with this keyword will pop up. If you want to be on top of search results, make sure that you add a few keywords in the description box of each post. Be wary of overdoing hashtags. Two to three hashtags per post are enough. Optimise your audience. 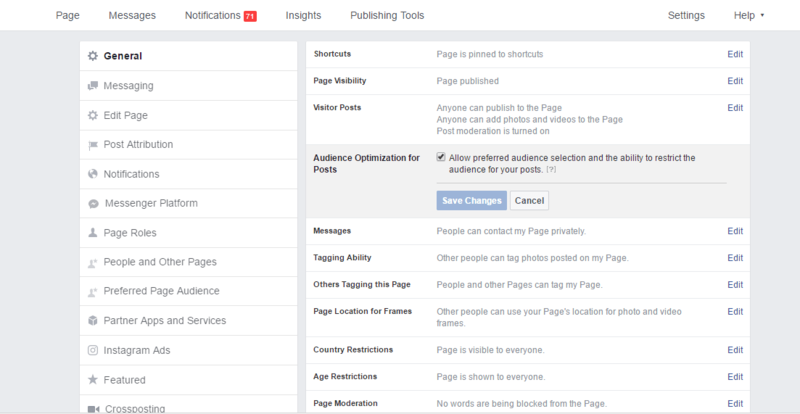 In the picture below is a screenshot of what a Facebook page’s settings look like. If you go three lines down you can edit your page’s visibility. Make sure that you’ve selected “allow preferred audience selection…”. This will help you to reach the right people. The trick to getting your Twitter page noticed is to use hashtags in your posts, especially hashtags that are trending. Word of caution – Don’t use popular hashtags in your Twitter bio or name as it will direct people away from your page. You can use a hashtag in your bio or name only if your company dominates it or if it isn’t so popular. Finally, add your Twitter handle in the publicise portion of your blog post editor. When readers share your blog to Twitter, it will mention your Twitter handle. This will get more people to follow your Twitter account. If you’re not sure how to do this, this blog explains it in detail. With Instagram, adding hashtags to your profile name works perfectly. I have done this myself and found that my follow rate has increased by 20%. Another tip is to have a simple Instagram handle. Handles with many digits or funny characters are difficult to remember and find.